Are you ready for some returning favourite parody television? 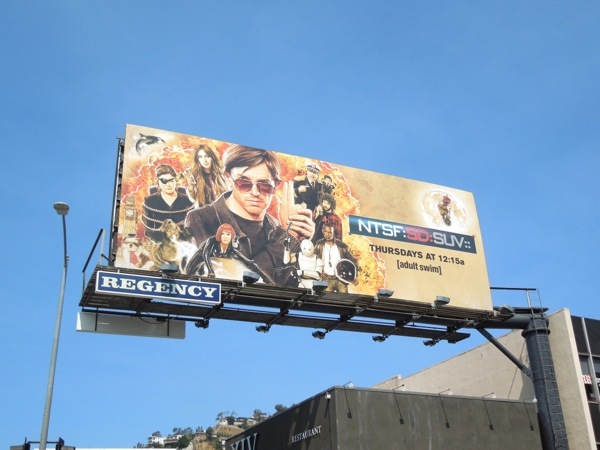 What's more, it's airing back to back on Adult Swim tonight. 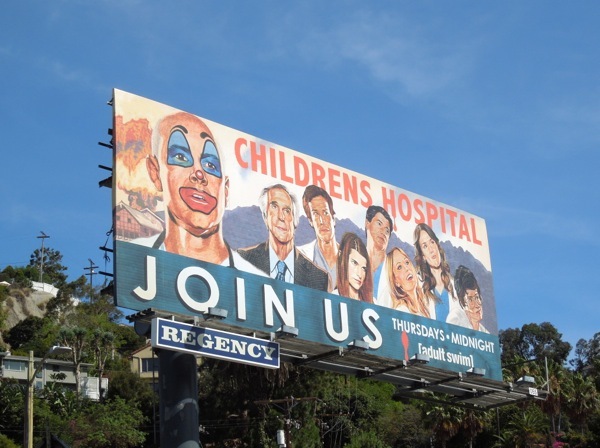 The Emmy Award-winning Childrens Hospital returns for a fifth season of live-action medical hijinks (in a pediatric clinic in a U.S. military hospital in Japan no less), whilst faux crime procedural (and Childrens Hospital spin-off) NTSF:SD:SUV:: is back for a third explosive series. In mega-geek news Karen Gillan aka 'Amy Pond' from BBC's Doctor Who, and soon-to-be-seen as the villainous 'Nebula' in Marvel's Guardians of the Galaxy, joins NTSF:SD:SUV:: cast members Paul Scheer, June Diane Raphael, Brandon Johnson, Kate Mulgrew, Martin Starr and Rob Riggle. The actress will obviously be in good company, as even this season three spoof action-espionage creative for 'Trent Hauser' and his team looks like a mix of James Bond and The Avengers. 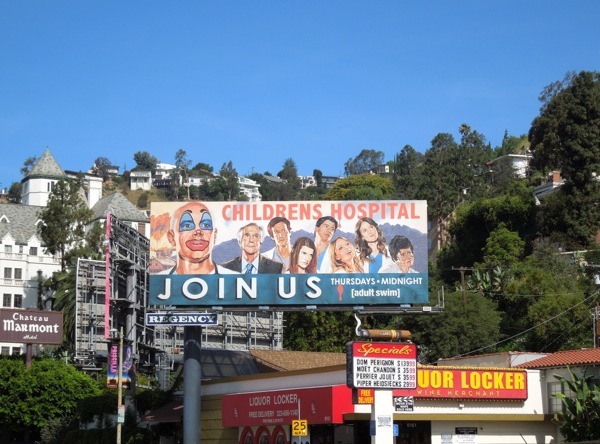 There was obviously a special deal on illustrated promo posters this month, as Childrens Hospital also gets a painted creative for their fifth season, which is actually a refreshing change for Rob Corddry's mock medical drama. If you like this latest ad, be sure to compare it to 'Dr. 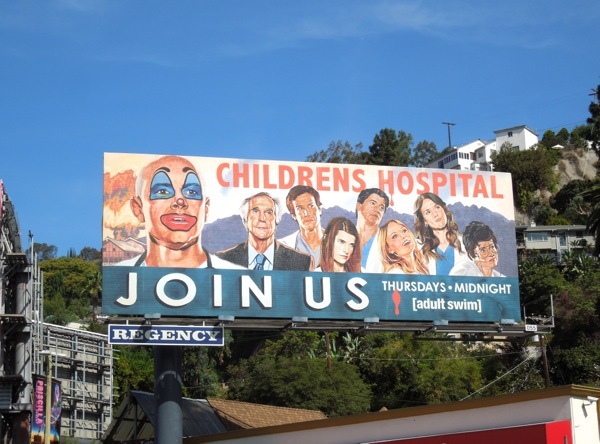 Blake Downs' clowning about with his crazy colleagues in these previous season Childrens Hospital billboards. 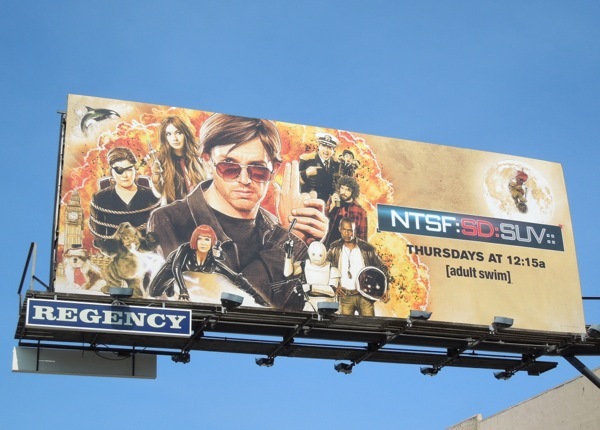 Meanwhile be sure to also check out the debut and sophomore season billboards for NTSF:SD:SUV:: here at Daily Billboard. 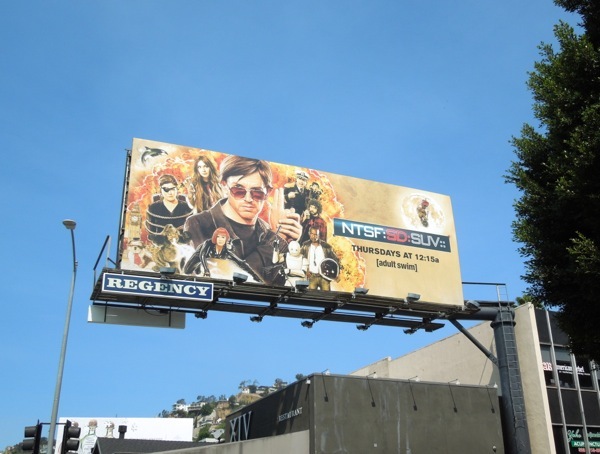 Both fun billboards for these fifteen minute live-action comedy shows on Adult Swim were snapped along L.A.'s busy Sunset Boulevard on July 16 and July 18, 2013 respectively.